This is a great picture. 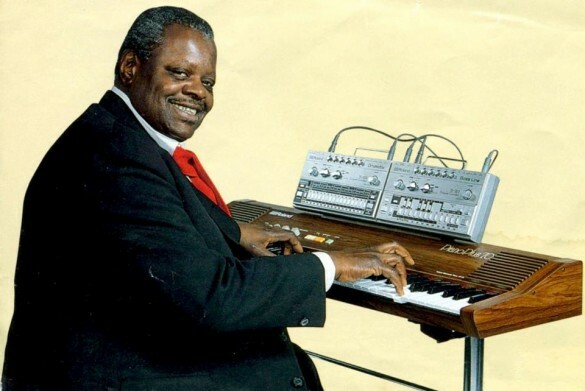 Jazz Pianist Oscar Peterson is playing along with two of Roland’s most famous synthesizers. The TR-606 and the TB-303 were meant to be used as a drumcomputer and a bass guitar. Too bad. The machines sounded nothing like the real thing at all and after 20000 pieces they stopped production. When electronic dance music hit the fan (we’re talking eighties), the machines were newly discovered as noise makers. Their rare status drove up the price to three times the original retail price and makes them highly sought after today. The sound of the 303 is iconic.